I don’t usually do re-posts, but I just read this article in the Seattle Times and had to share – the Northwest Flower and Garden Show, the biggest deal in town, has finally, finally found someone to take it on and continue all the fun for another year, with “no major changes” planned. Phew! I hope they find a way to make it profitable enough to keep it going for a long while yet. Even though I complained about some aspects of the show this year, it’s always such a source of inspiration and education and I was really starting to worry that it was gone for good. I’m going to get my tickets early this year, maybe for more than one day this time. Hooray for reprieves! Washington State Nursery & Landscape Association Display Garden image courtesy of the NWFGS site. 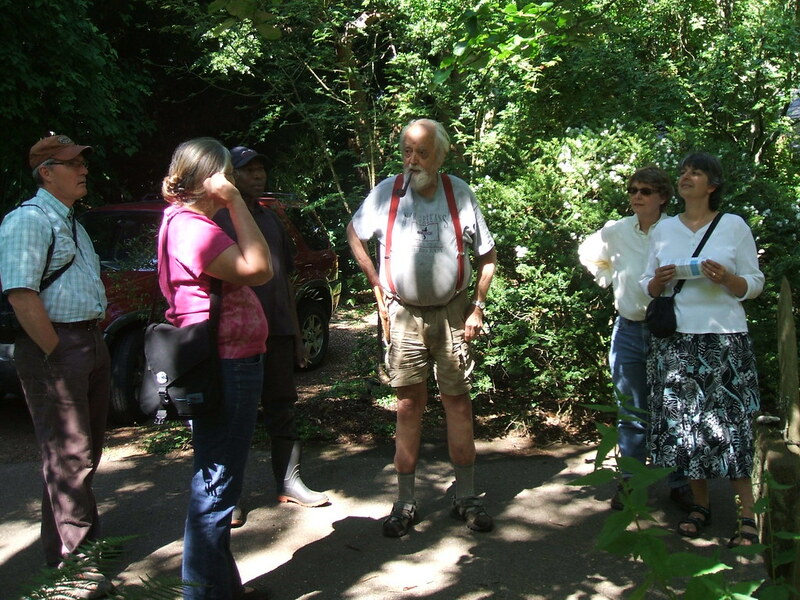 SAGBUTT (Seattle Garden Bloggers United to Talk) skipped May for need-to-be-gardening reasons but came together yesterday to visit the Kruckeberg Botanic Garden in Richmond Beach, WA, just north of Seattle. Molly of Life on Tiger Mountain graciously organized the trip, and for those of us who were lucky enough to get there early for a chat at a nearby coffee shop, we got to sample some of here incredible lavender shortbread cookies. I hope she will put up a post too on our outing, and maybe she’ll include the recipe (hint hint). I had been “bird-dogging” (his words – I’d say “relentlessly bugging” was more accurate) David Perry of A Photographer’s Garden Blog to join us since he expressed semi-interest months ago. This was the day when his scheduling stars alinged, and it was great to meet him and welcome him to the crew. Besides him and Molly, we were joined by Daniel of Daniel Mount Gardens and his lovely partner Michael, and the (Weed Whackin’) Wenches (the look on David’s face when they introduced themselves as such was priceless), Curmudgeon and Wingnut. Paula from Petunia’s Garden made a Herculean effort to attend, accompanied by her neighbor, but between road closures for the Seattle Marathon, car trouble, and a host of other issues, she never made it and we missed her! We’ll just have to go back and hope to gather even more folks next time. OK, enough with the roll call. 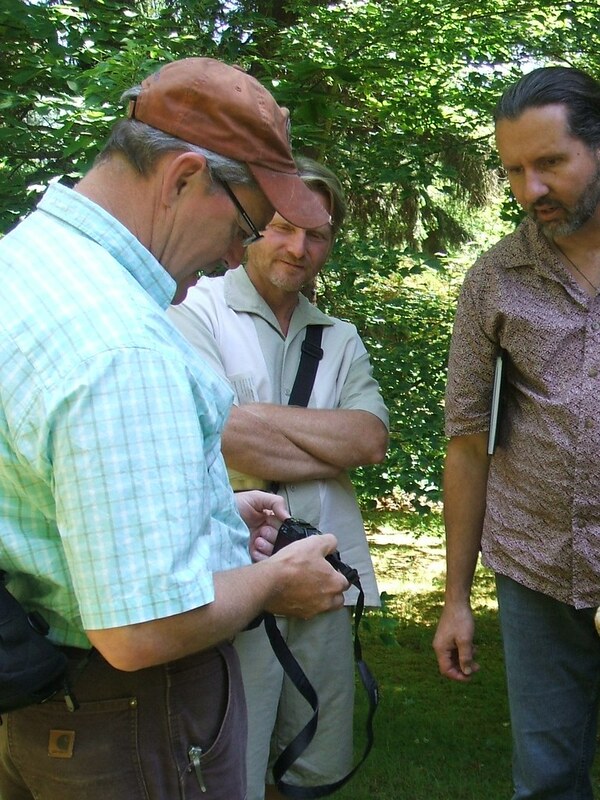 Botany professor Dr. Art Kruckeberg and his wife Mareen moved to the property in the 1950s, when their turn-of-the-last-century farmhouse was about the only thing around. From flat pasture land, they built acres of woodland gardens in a naturalistic style that showcases texture and foliage over pure showiness of flowers. 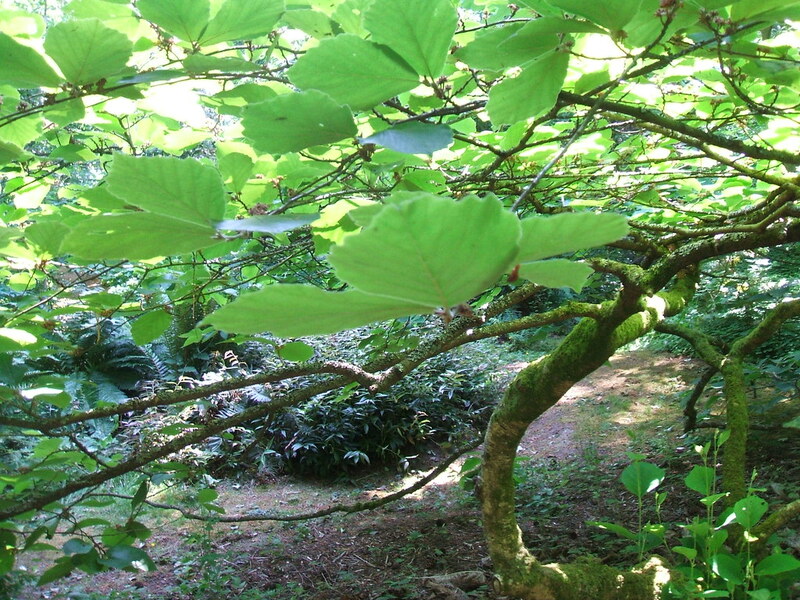 You can see their personal interests in oaks, witch hazels, and many other categories of trees and plants which they collected seeds and cuttings from all over the world to grow. 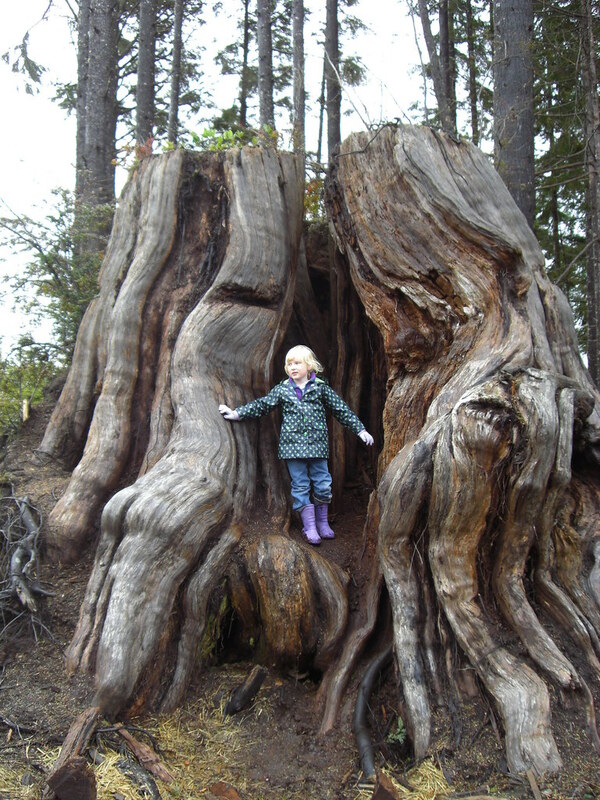 Mareen, who passed away in 2003 at the age of 77, also founded the MsK Nusery on site, which continues to feature Northwest native and rare plants for sale to the public. There was more to see there than could be absorbed in a single visit. Plus, we were ambling around kind of aimlessly, talking and noticing things and talking some more. 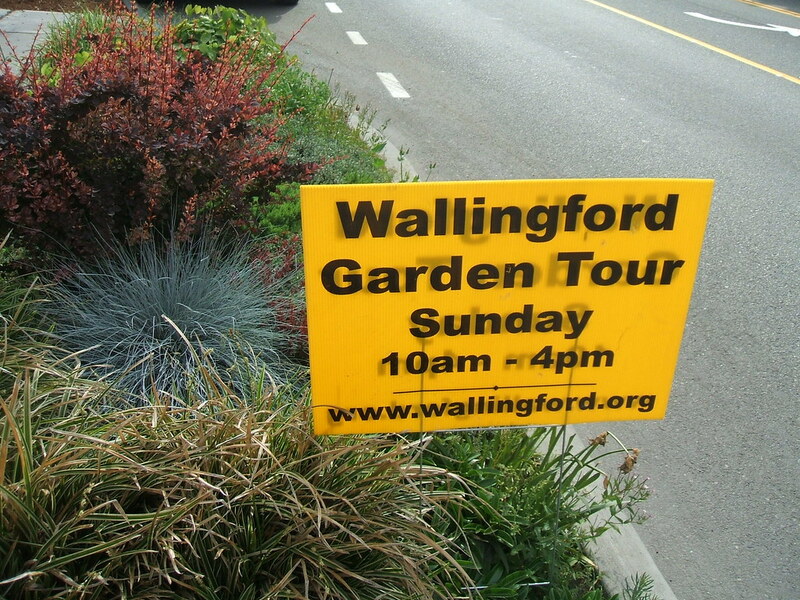 They do offer guided tours and also a map for a self-guided walk, plus their web site has quite a few photos and plant names to peruse. What follows are just a few of the things that caught my eye during my short time there. 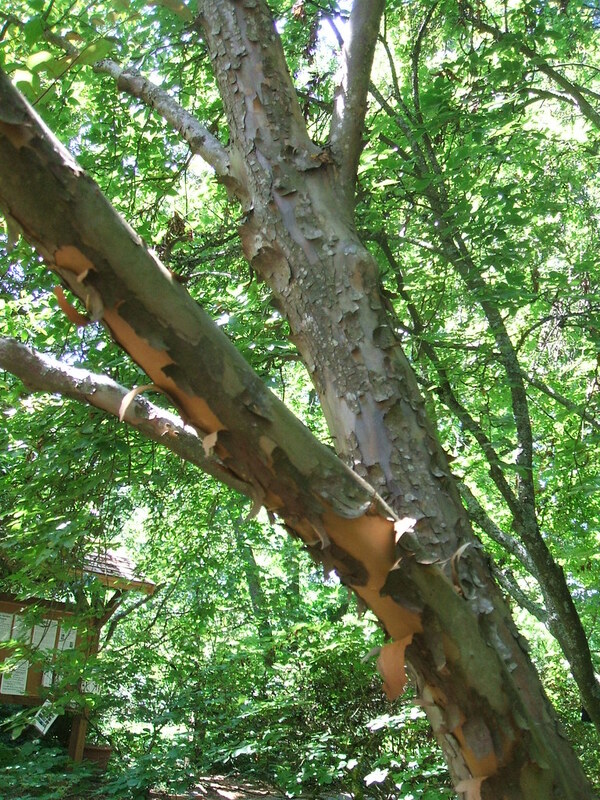 A mature Stewartia monadelpha (Tall Stewartia) showed, with its multi-colored and exfoliating bark, why many consider this one of the “must-have” trees in our area. It does take some years to grow this big and start to have its interesting bark, so patience and staying in your garden a long time are givens. 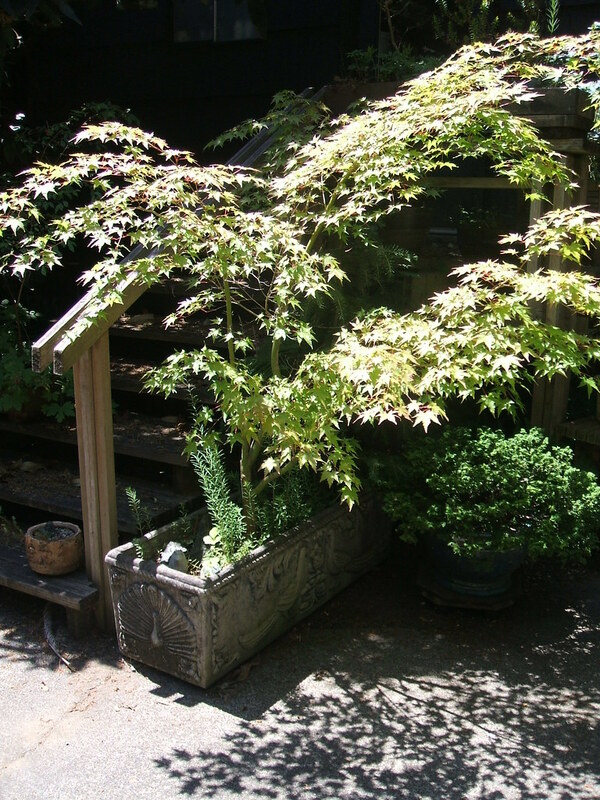 Small maple of unknown variety in a lovely rectangular planter. Why don’t I have any planters like this?? Daphne mezereum sp. Album, a type of daphne I hadn’t seen before. I kind of wanted it for these green berries but when I looked it up, it seems like maybe not a good one for a garden with kids around – super toxic, possibly coma-inducing or fatal! Yikes. 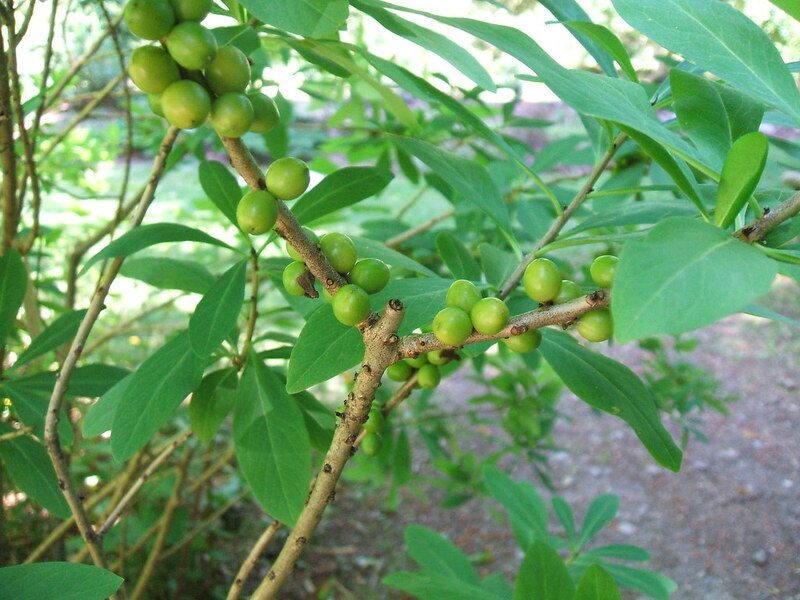 Growing directly above the poison daphne, this graceful Indian Plum (Oemleria cerasiformis, aka Osoberry, Oregon Plum or Skunk Bush – geez, this one has a lot of handles!). This is another fairly new plant on my radar, just saw one in a nursery last week and had to put it down when I saw the price (over $100) for a mature shrub. 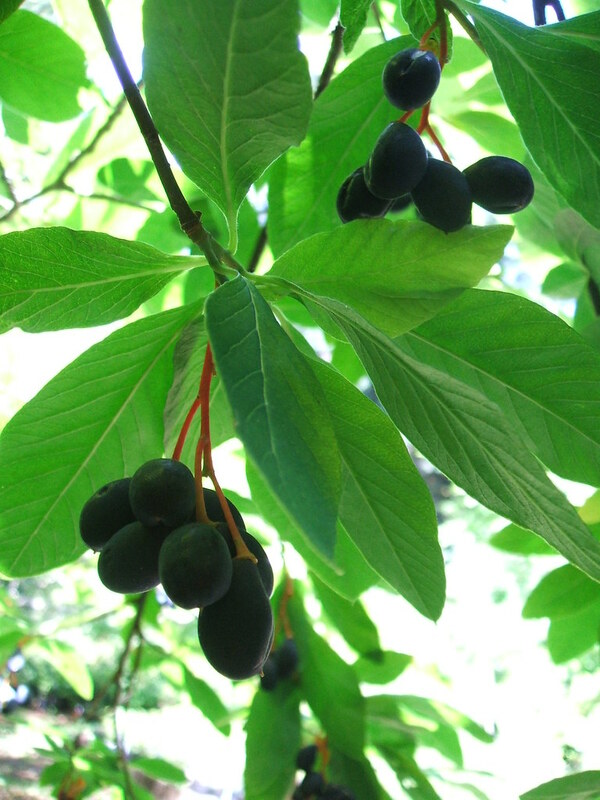 The fruit are tiny and seem more likely to be eaten by wildlife, but apparently they were a food and medicinal source for native peoples in the Northwest. I just love them for the tiny perfection of the “plums,” the way the fruit are clustered, and their red stems. I pined openly for one and a fellow blogger who shall remain nameless said I might be the lucky recipient of a free one that came up as a seedling. Hooray! Magnolia macrophylla, still with fat buds on it so hasn’t bloomed yet. 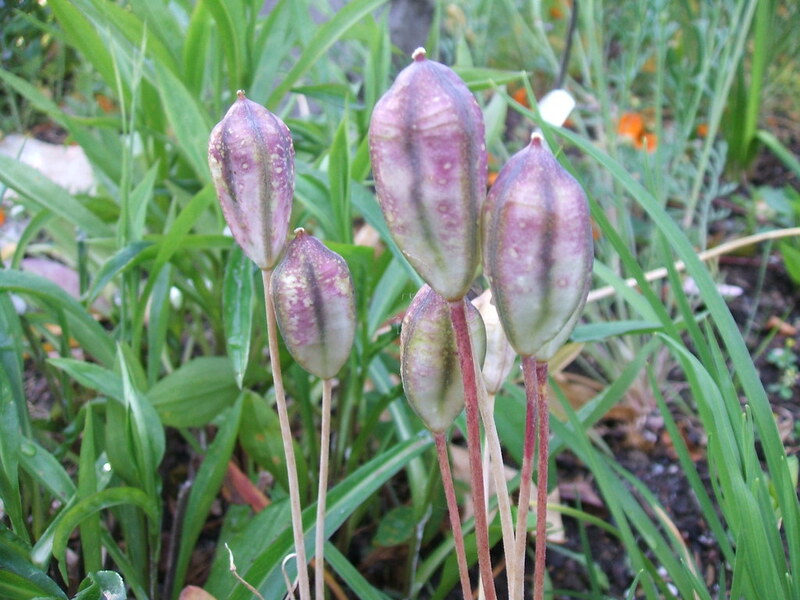 My first experience with this plant as well, except as a blog-admirer of them from afar. When they get as big as this one, the experience of being dwarfed by the leaf clusters is just so cool. There were quite a few sculpture installations throughout the garden. I’m still not sure how I feel about stuff like this. Does it clutter up a perfectly lovely garden or does it provide a little humor and a break from just looking at leaves all the time? 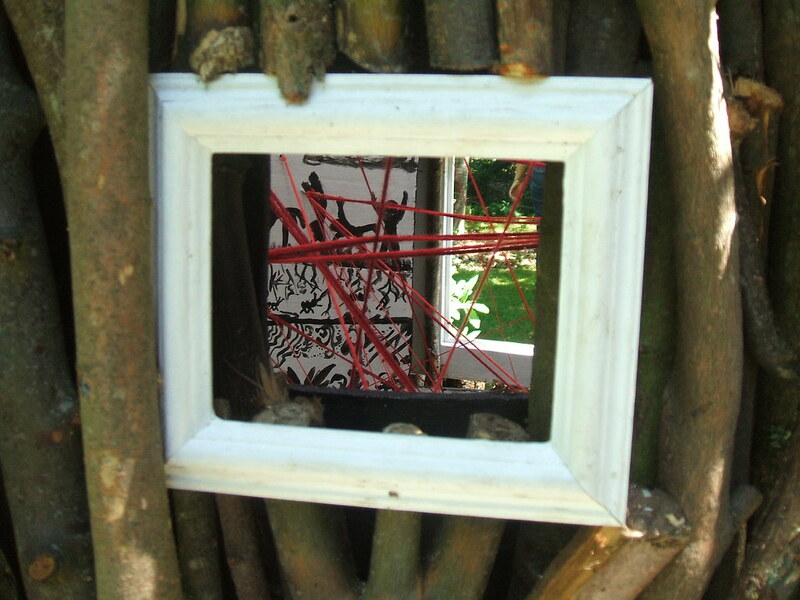 This was a big bundle of sticks shaped like a tree snag with drawings and red twine on the inside, with windows to look in through. 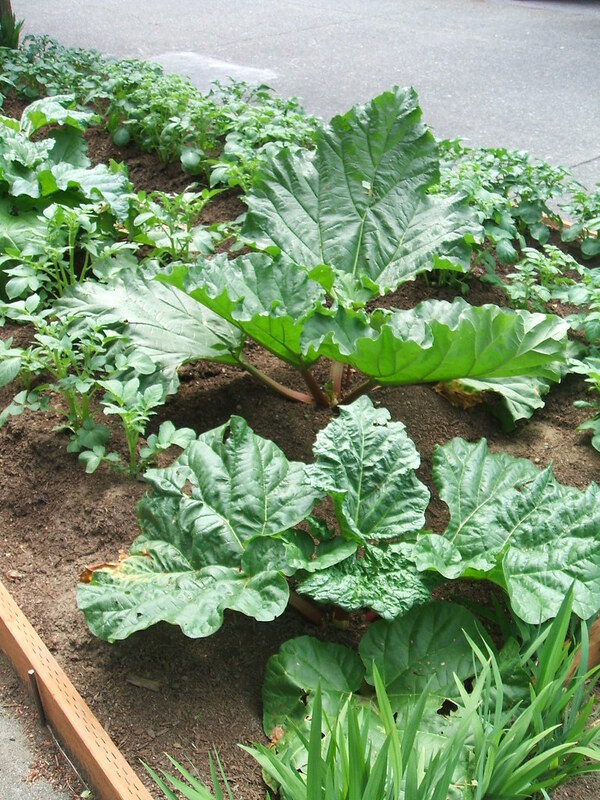 The entire garden seemed to be planned far more with foliage and texture in mind than flowers. Maybe we were there at an odd time for color, but I really enjoyed the way our eyes had to go up, down and around to examine what was before us, instead of just being drawn on in the typical way with band upon band of color. 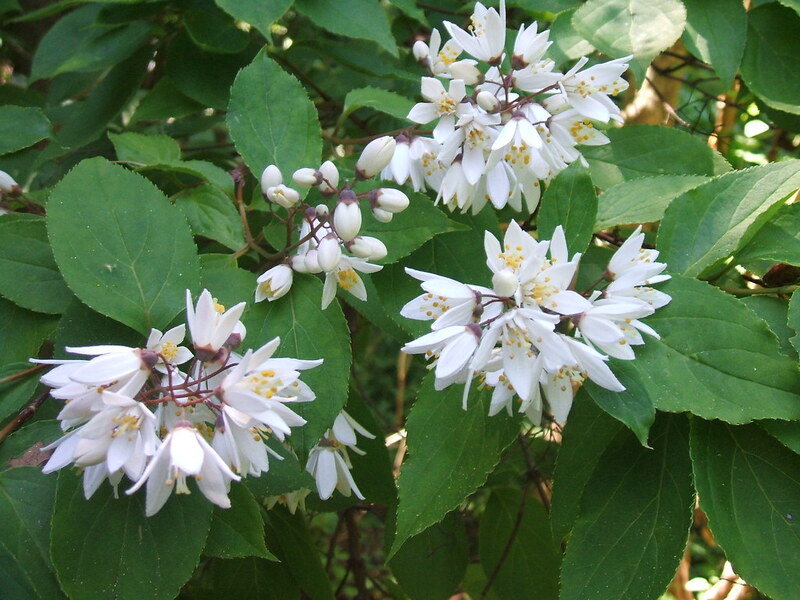 This shrub, which Molly IDed as a Deutzia glauca, was one of the few things in bloom in late June. It also had amazing, peeling bark. We all had to ask David what camera he recommends, since he’s a pro photographer. He said he has to tote so much equipment for work that he really enjoys having a smaller camera at hand for just the fun stuff. His big pitch was for the Canon G10, he feels it has really great functionality for the price ($400 range) and will keep a regular user challenged for years. Here he is, showing David and Michael what it can do. Have you ever had the experience of taking pictures next to someone else and wondering how differently the images will turn out? At the Indian Plum above and at this Witch hazel (Hamamelis x intermedia), David and I both stopped and examined and discussed the plants’ forms but I’m sure his takes will be so much clearer and better framed, he will have found details I missed, gotten things to line up right. I hope to learn more of how to look, learning from his example. Another tree I felt like I’d missed before somehow, Acer mono. 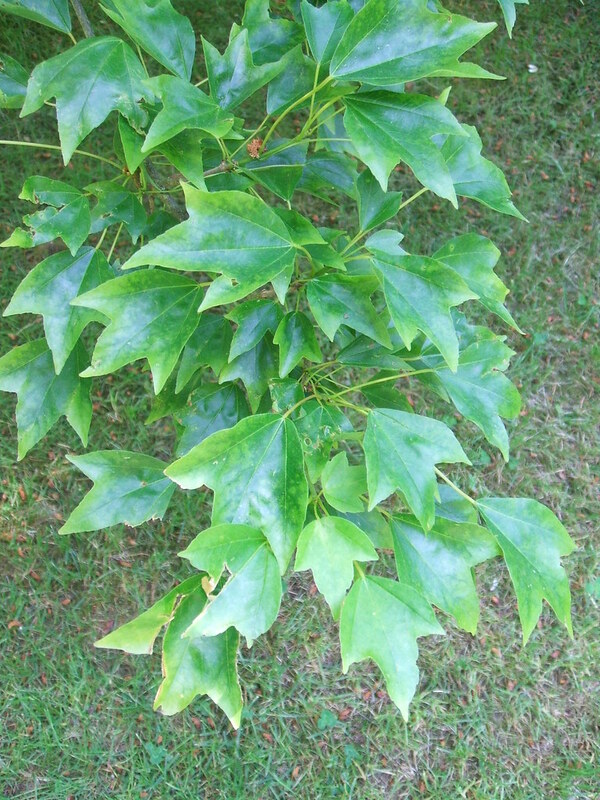 So many maples, I think I love all of them (even you, damn Acer negundo). 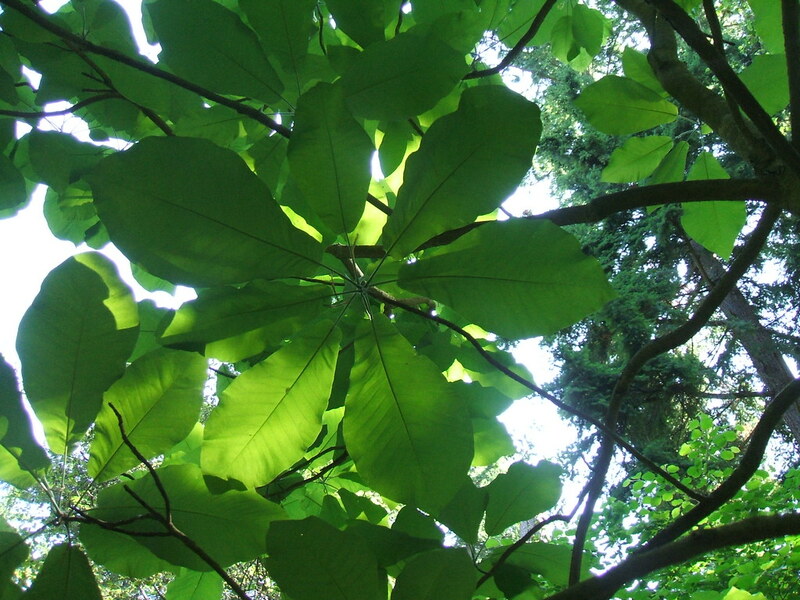 This one has a subtle grace with its funky-shaped leaves that are so shiny deep green. Trees in general, at least for me with my tiny city lot, are such a commitment. I’m struggling to choose just a single shade tree for my backyard, and it’s taking me months. Here, they started with nothing but open acreage and a lot of plant knowledge, and just got going. And now, 50 years later, you look up into these partial and full canopies that are the work of these two human beings and their helpers. It’s pretty awe-insipring. Not too many fragrant bloomers at the moment, but I imagine they are there at different times of year. 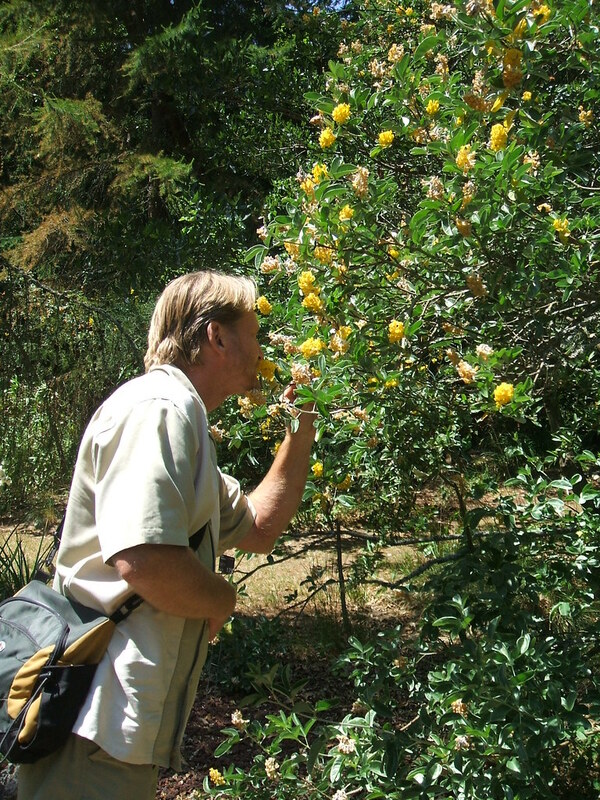 I might have to track down one of these for my parking strip garden, Pineapple Broom (Cytisus battandieri) from Morocco – Daniel’s just checking to see that it does really smell like pineapple, which it does! We had lingered longer than planned and Daniel and Michael had to go. Just after they departed, we saw a white-bearded figure emerge from the main path and figured it couldn’t be anyone than Dr. Kruckeberg himself, still going strong (and out doing some weeding) at age 89. Well, of course the rest of us couldn’t leave then! We were the lucky recipients of an impromptu tour of part of the upper garden, which we’d neglected to explore previously. We heard stories about how the plants came to them, how his wife propagated so many of the trees and shrubs that are now mature, which are his favorites (he has so many! ), even a little about his service during WWII that took him to Japan and its nearby islands. Here he is, only beginning to realize what he’s gotten himself into by appearing available to chat with a bunch of plant nuts. (From left – David, Molly, Roland (? he said he has been a gardener there for almost 30 years, which hardly seems possible given he looks 25! ), Dr. K, and the Wenches (Wingnut and Curmudgeon). This garden is pretty great with the plant tags, but it was more fun to hear so many botanical names spilling forth from Dr. K (he was right on every one). 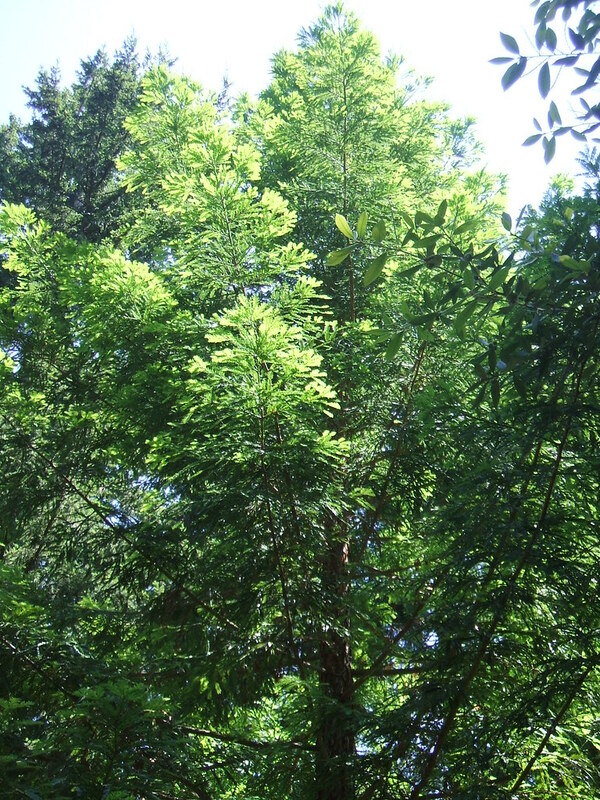 I would never have guessed that this remarkably large-leaved shrubby tree was an oak, but we got to hear all about how the seeds came from Turkey, from the area near the Black Sea, via a wealthy textile manufacturer who is now the John Muir of Turkey. 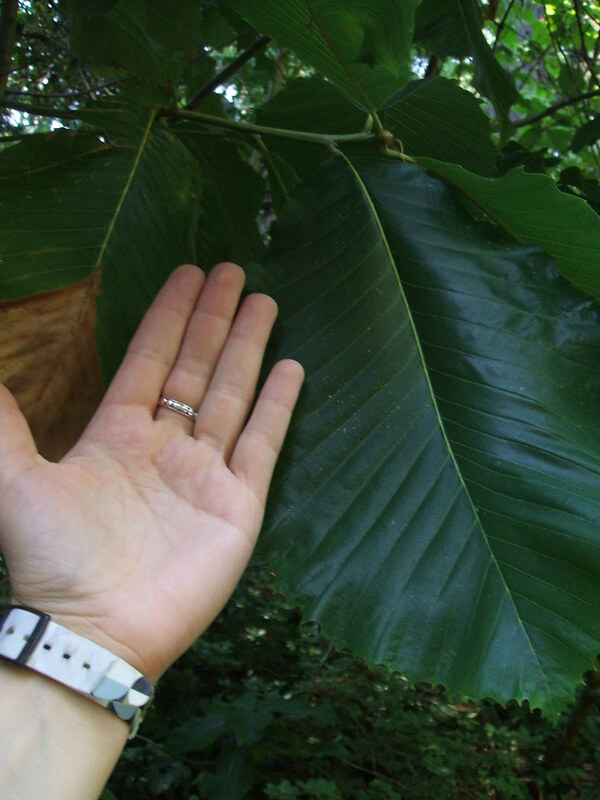 Sorry, I had to put my hand in this shot just to give an idea of how huge the leaves are. I think I am correct in saying that none of us felt we had seen all there was to see at this garden, but that we all came away wanting to return. I definitely hope to see it in other seasons, especially fall when the leaves of the maples and witch hazels are putting on their fall colors. I have more photos, so maybe I will do a second post if I can find the time. Or maybe I’ll just look for what the rest of the gang saw, if and when they choose to share it. 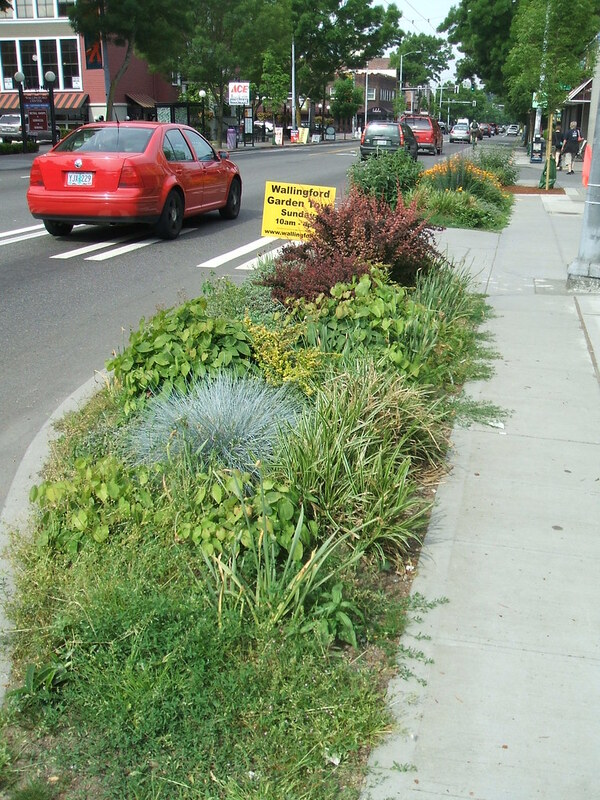 Who says that major city thoroughfares and nice streetside plantings can’t mix? Someone in Seattle’s Wallingford neighborhood decided to buck the trend of boring parking strips along the busiest street in the sector, 45th Ave, and put in something really enjoyable to walk past. This strip is actually in two sections, separated by a crosswalk. 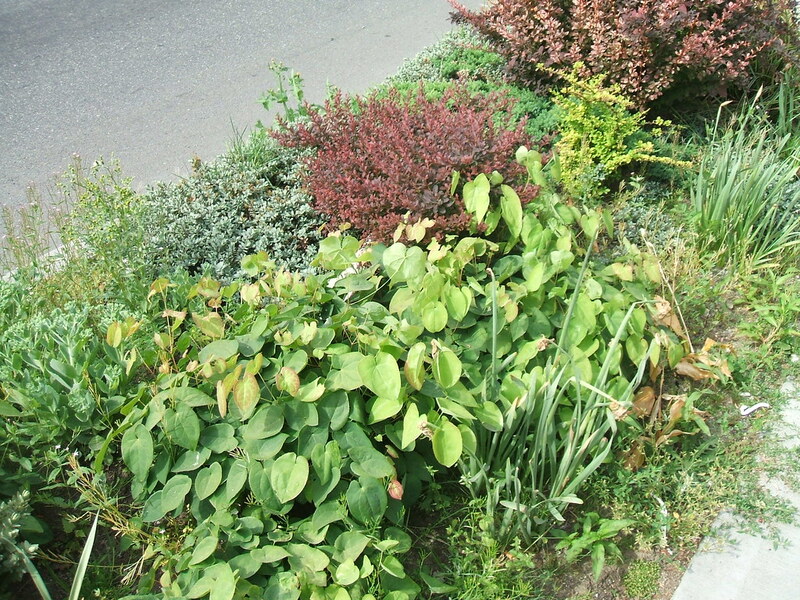 Even though cars, trucks, and buses thunder by regularly to and from the freeway, the neighborhood is actually very walkable and having some nice perennials to look at on the way distracts from the vehicular noise. I kind of wish I could go back and start over in my own parking strip, choose plants more carefully and intelligently and have something harmonious like this. It does look like a designer was involved, but in a good way. Epimediums, barberries, and small-leaf hebes are all tough, drought-tolerant plants that should need little or no care throughout the year. 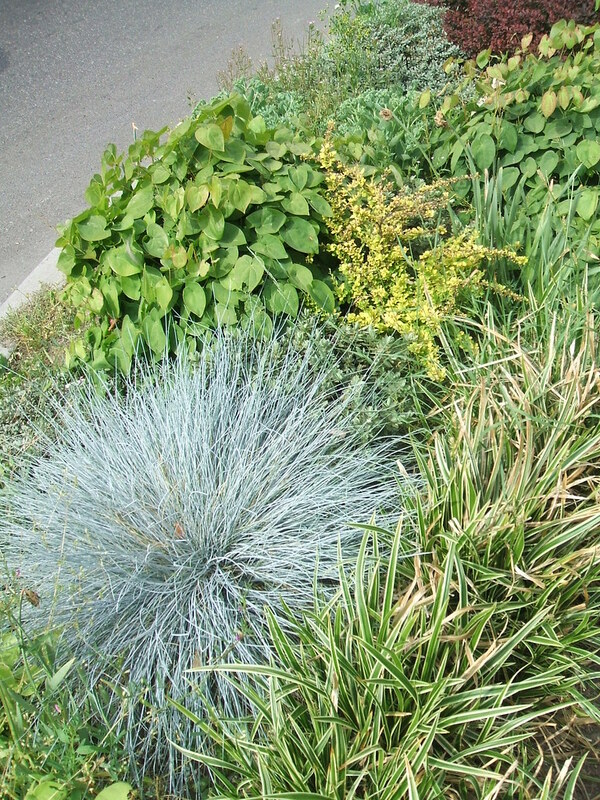 Grasses like the blue fescue below and a mass of Carex morowii ‘Ice Dance’ on the edge (guessing on that one) are also able to take the heat and keep looking good. 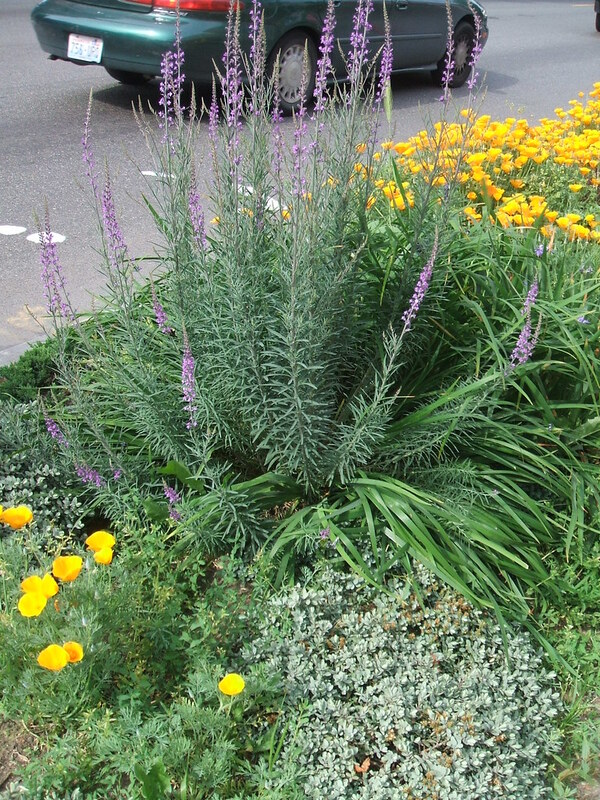 In the second part of the strip, purple spikes of Linaria harmonize with silvery groundcover and the brilliant orange of California poppies. I missed the neighborhood garden tour, as it happened when I was on kid duty all day and I didn’t think she could hack it. Plus, $15 per person, maybe another year. Did any of you locals go? I just read recently that the trick to getting tulips to repeat is to plant them in an area where they receive little or no water during their dormant season. 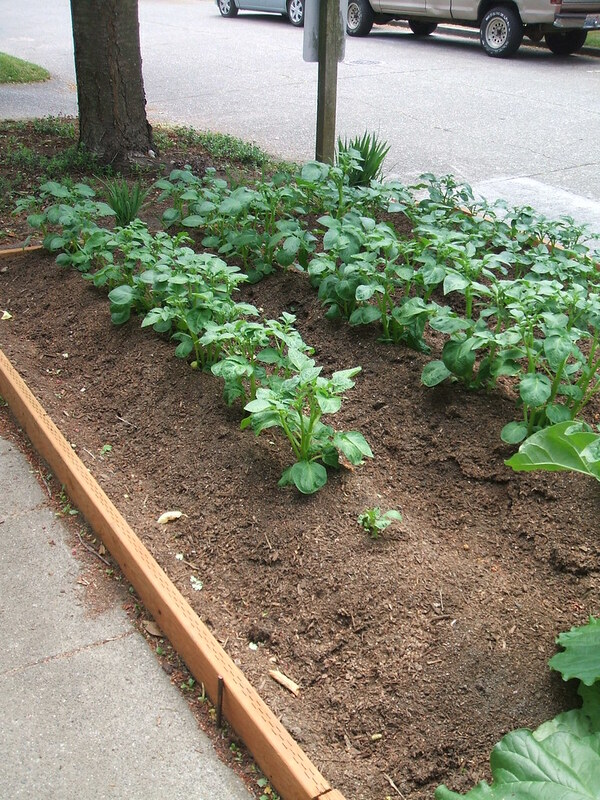 If they’re where it will get wet, it’s better to dig them up and store them until fall, so they don’t rot. I might have to go to the trouble, which I never have before, for these ones. They’re just too cool to treat as an annual like I usually do with tulips. It’s weird to be thinking about bulbs now that the Summer Solstice has passed, but I’m trying to be good about letting my bulb foliage hang around as long as it needs to, so I’m grateful this bunch is at least not too ugly to look at amid all the surrounding greenery. It seems like it was about two weeks ago that I wrote this micro-post about sending my only child off to kindergarten. I’m not too sure where the ensuring 10 months went – some was spent here, avoiding other tasks and looming unfinished projects. 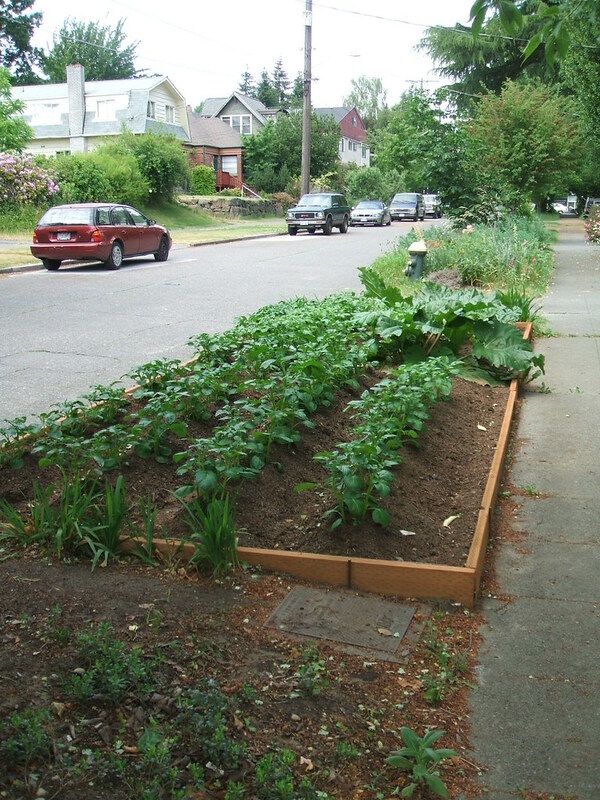 It was always more fun to think about the plants in my own garden, those around town that I saw here in Seattle, and to read about everything you folks have been up to all over the world and to exchange ideas through comments. Some things went smoothly for my daughter this year, others will continue to be a challenge. She has some brain differences and although she is undeniably smart, funny, observant and creative, her sensory, social and flexibility issues make “doing school” pretty exhausting for her (and, in its aftermath, for me). It’s easy for me to get caught up in the negatives but I just want to take a non-garden-related second to congratulate my baby for her achievements this year – making new friends, learning to write, studying in-depth about green sea urchins, figuring out how to navigate in the noisy hallways, going on a few field trips without mom, always participating in games during PE, sharing a locker, and many many more things that seemed impossible at the beginning of the year. Congratulations to all graduates and their families. Hope the transition to the next phase of school, work or life goes fabulously! I will probably look back fondly on the days that the squirrels were my most formidable garden adversary. It seems the raccoon population of Seattle has rebounded from what may have been a temporary period of virus-related low population numbers (unverified rumor, so don’t quote me) and it seems that some of them have been up to a few tricks lately around my garden. Nothing too devastating yet, but they’re putting me on notice for when the raspberries and blueberries get closer to ripening. 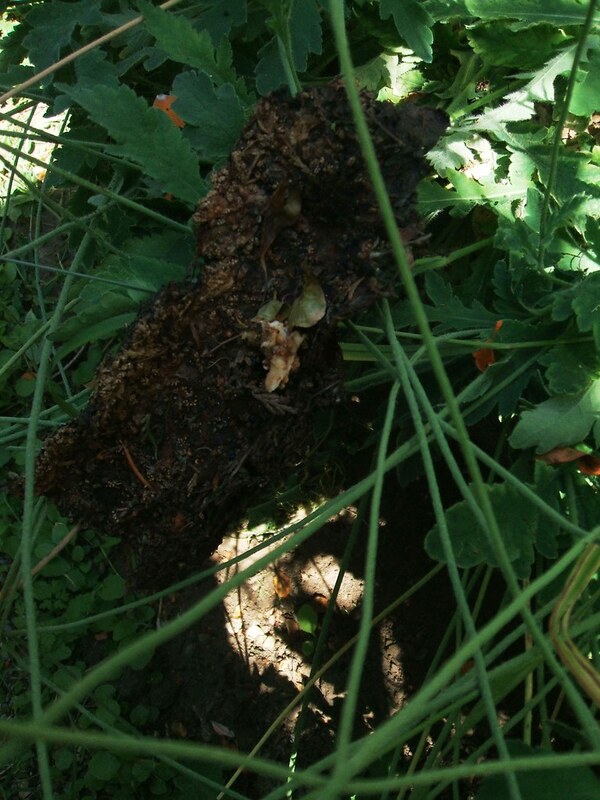 First, I noticed a large piece of tree bark abandoned in a shady spot, on a clump of poppies. No trees with this kind of bark in my garden or even nearby that I can see. Where did it come from? Who left it there? What are they up to?? 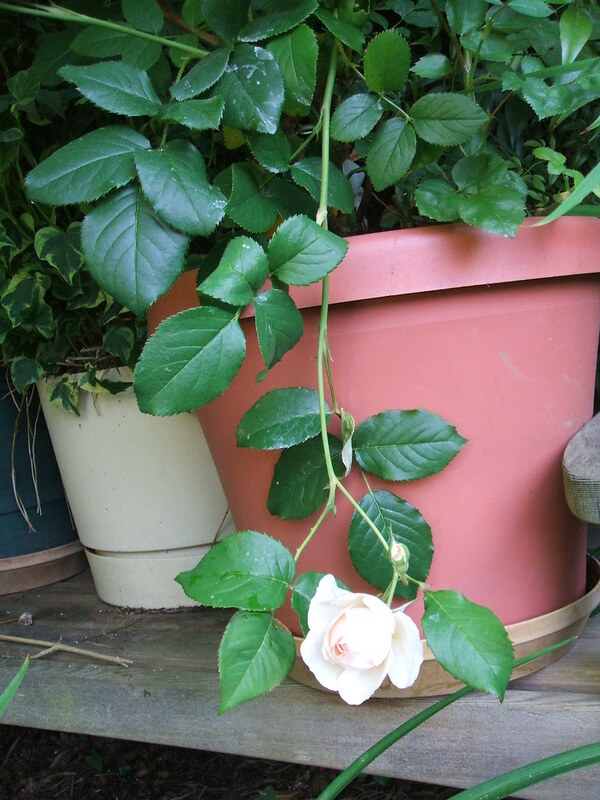 Just a few feet down the path, my potted ‘Heritage’ rose, the only rose I have ever seen, smelled, tracked down and bought on my own, had its single currently blooming stem broken off almost all the way, it was dangling by a thread but still flowering. Hm. Other people could suspect their dogs, or maybe their kids, but we don’t have any pets and my daughter is actually pretty careful in the garden, at least in this part of it. 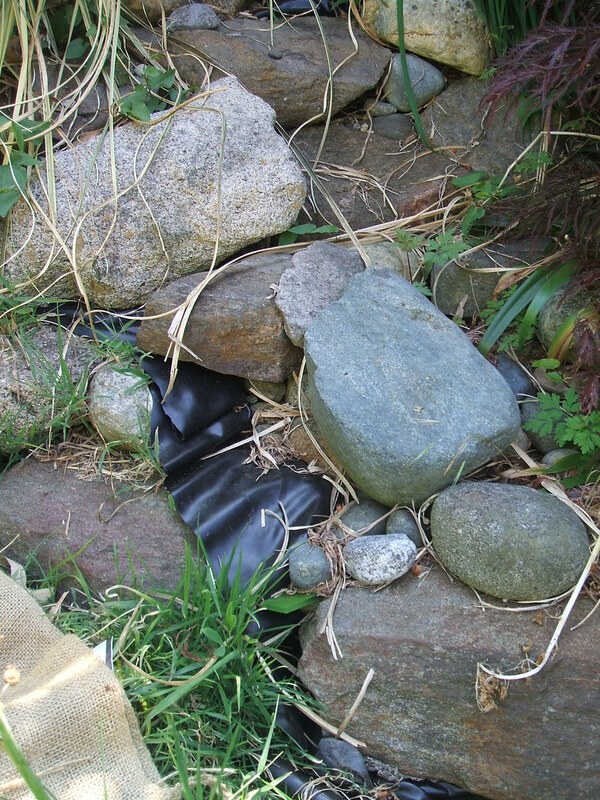 The next clue that the masked bandits may have been responsible was the stones that had obviously been rearranged in our rockery. It’s a mess at the moment, I’m ripping out weeds and plants and haven’t got around to fixing up the defunct mini-pond yet, but they obviously needed to have a look-see for potential fishy snacks (sorry, guys, no help there) or maybe wanted to dip in some tasty morsel from our city food scrap/yard waste bin on trash night. 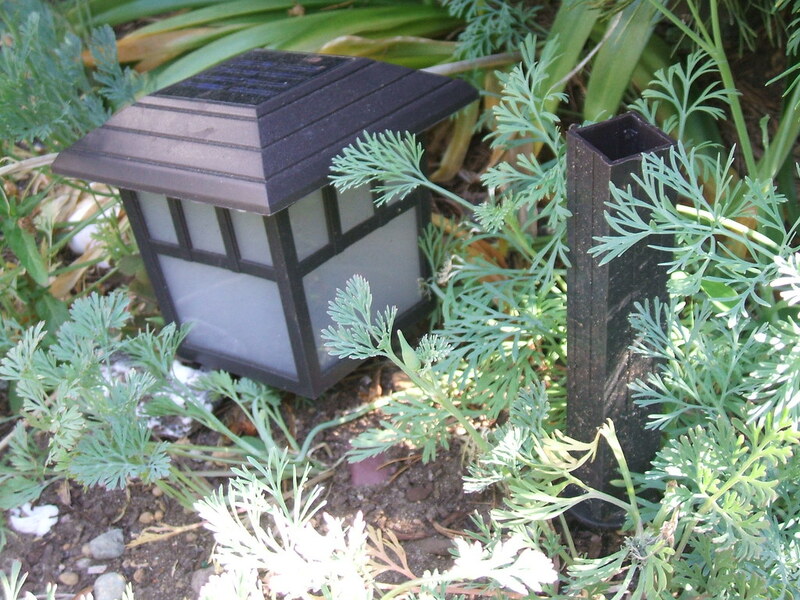 Last clue – my faux Craftsman plastic solar light by the rockery was temporarily decapitated. Huh? When I mentioned my puzzlement to my mom, she said “Well, they like to be busy.” I guess I can admire their curiosity, as long as it doesn’t turn too destructive. My parents had to give up on their Italian plum tree, it was just stripped every year by the raccoons before my folks could get even a single ripe plum. They also got most of my parents’ corn last year, and I do think I need to study up on possible (benign) berry-defense methods. Some people think these critters are too cute for words; others consider them a menace and a nuisance. Really, they’re just part of the natural world and, like crows, rats and a few other species, have proven remarkably adaptable to urban environments (possible viruses notwithstanding). I think that if they are here, I will just have to learn to deal with them. Their ancestors were certainly here before mine were, so they kind of have dibs on the land if they want it. I might not be so sanguine, however, if they take every last one of my berries this year! Do you have any raccoon stories to share? Raccoon image by Liza31337, courtesy of Flickr Creative Commons. To see more images by this photographer, please click here. Just as I was about to publish this post, I read a sort of frightening article by garden writer Ann Lovejoy about potential health hazards from raccoon droppings. Eek. I guess I need to keep my gloves on when I’m working in the yard, and make sure my kid doesn’t come into contact with any critter poop!